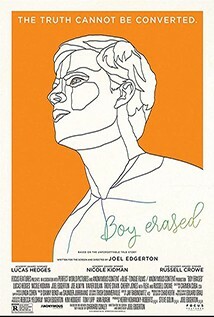 The true story of Jared Eamons (Lucas Hedges), the son of a Baptist pastor in a small American town, who is outed to his parents (Nicole Kidman and Russell Crowe) at age 19. Jared is faced with an ultimatum: attend a conversion therapy program - or be permanently exiled and shunned by his family, friends, and faith. Joel Edgerton, in only his second role as director after a successful acting career, proves an incisive filmmaker. Every beat has weight. Every close-up registers. He values silence - he trusts you to feel things along with his characters, and never falls into the trap of portraying the parents as backward-thinking caricatures.